The MacBook is the world’s most famous notebook for a reason. While not updated as frequently as some competitors, the Mac’s excellent design and build quality makes every system feel timeless. It’s common to call a new computer an “investment,” and with a MacBook Pro or 12-inch MacBook, that feels true. But Apple isn’t a charity, and it charges a lot for the privilege of owning a notebook with its logo. Many who’d like to own a Mac simply can’t afford it. Fortunately, there are Windows and Chromebook alternatives that are nearly as well built, and they sell for hundreds less. Here they are — the best MacBook alternatives you can buy. The newest MacBook Pros aren’t exactly widely beloved. Thanks to the move to offering only four USB-C ports and that controversial Touch Bar, people came away unsure of where to put their money. The right choice for most people will be the 13-inch MacBook Pro without Touch Bar, which starts at $1,300. There are a number of PC laptops that are good alternatives such as the HP Spectre 13 and the Lenovo Yoga 920. Our favorite, however, is the Dell XPS 13. It’s every bit as beautiful as the MacBook Pro, all while offering great CPU performance and a lot more port options. The least expensive version of the XPS 13 might actually be considered a MacBook Air alternative. It’s only $800 and boasts a Core i3 processor paired with 4GB of RAM and a 128GB hard drive. If you were thinking about the MacBook Pro, though, we recommend the $1,000 model, which has a Core i5 processor and 8GB of RAM. The 128GB hard drive remains the same. The 1080p display isn’t quite as nice as the MacBook Pro’s, but when you bump it up to the Core i7 configuration for $1,300, the performance boost alone makes it worthy as an alternative. Yes, that’s right. Another Dell. The negative buzz from its unfortunate “Dude, you’re getting a Dell!” era still lingers, and that’s a shame, because the company builds the best PC notebooks available today. The XPS 15 is essentially an XPS 13 on steroids. It has the same “Infinity Edge” display, but in a larger size, and with more powerful hardware. While a $1,000 configuration is available with a Core i3 processor, we recommend at least the $1,200 model. That nets a Core i5 quad-core processor, 8GB of memory, a 1080p display, a hybrid hard drive with 1TB of storage, and GTX 960M graphics. Aside from display resolution, this version of the XPS 15 makes few concessions to Apple’s 15-inch Pro. You can even upgrade it to a 4K display, though doing so will set you back $500 bucks. There’s also a top-shelf, $1,700 model that’s worth attention. It boosts the hardware to a Core i7 with 16G of RAM and a 512GB solid state drive, and it also ups battery capacity to 84 watt-hours. Dell says that model can hit 17 hours of battery life in optimal conditions. Even this version is $300 less than Apple’s most affordable MacBook Pro 15, which doesn’t have a discrete graphics chip. All models of the XPS 15, like its little brother, are notable because of their size. While it has a 15-inch display, it weighs as little as 3.9 pounds, a half-pound less than the MacBook Pro 15. That means Dell’s system is actually more portable than Apple’s more expensive alternative. The Pixelbook is not a perfect laptop, but to be fair, neither is the 12-inch MacBook. However, the kind of person who’d be interested in the MacBook — someone who wants thin, classy, head-turning design — would also be interested in the Pixelbook. Neither laptop has the best CPU, but you shouldn’t be picking up either of these laptops for their gaming and video-editing prowess. 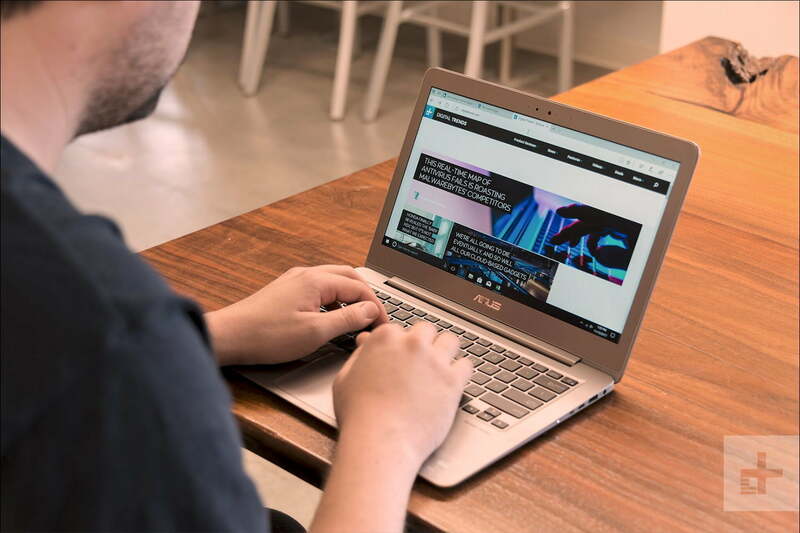 They are fantastic laptops at handling the daily tasks that the average person does, whether that’s streaming Netflix or working with 10-15 browser tabs open. The Pixelbook starts at $1,000, while the 12-inch MacBook starts at $1,300. On top of that, the Pixelbook is a 2-in-1, meaning you can flip around use it as a tablet in bed or on the go. This one is a two-fer. It’s not because the 12-inch MacBook and MacBook Air are all that similar, but instead because the Asus Zenbook UX330UA is both a great notebook and an affordable one. For $750, you get a powerful, long-lasting laptop with a great keyboard and display. The UX330UA avoids the pitfalls of many “budget” laptops by not compromising in any significant area. It’s got over 11 hours of battery life, and now comes packed with the newest 8th-gen. Intel i5 processor. In terms of processing power, you’ll be delighted by the comparison to what you get in the old MacBook Air or low-powered 12-inch MacBook. The cherry on top is how tiny this laptop is, coming in at thinner than even the MacBook.